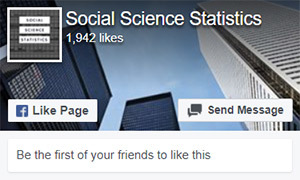 This web site offers free resources for students and researchers working with statistics in the social sciences. All the calculators and tools featured here have been designed with ease of use and clarity of presentation in mind. Certainly, you should find them much less cumbersome - and definitely less expensive! - than SPSS and the like. The web site has three main sections: statistical calculators, which deals mainly with hypothesis testing; p-value calculators, which allow you to derive p-values from Z, t, chi-square and Pearson (r); and descriptive statistics - averages, variance, a standard deviation calculator, and easy histogram and bar chart makers. Why Should You Trust These Tools? The output of the calculators and tools featured on this web site has been audited for accuracy against the output produced by a number of established statistics packages, including SPSS and Minitab, so you can be confident that you're not being led astray by using our resources. In the interests of full transparency, we ask you to read our legal disclaimer, which sets out the legal basis of your use of this web site. Put simply, while we make every effort to ensure the accuracy of the tools featured here, we cannot guarantee their accuracy, and you use the web site on that understanding. If you want to be notified of new resources as they're added to the site, please like our Facebook page or follow us on twitter.